INC has three names for party candidates Padi Richo, Nani Ribia and Khoda Gyati from 17th Ziro-Hapoli Assembly Constituency. Who will get the ticket it is not finalised, but the one thing is good among these three aspirants that ” they have decided to work together to defeat, BJP. It is no mater that “who will get the party’s ticket”. stated these three aspirants in a press conference here in Itanagar. They said that Party will decide who is the winnable candidate among us. Definitely one among three of us will get the ticket, but we will fight together for the victory of the party. Earlier, Er. 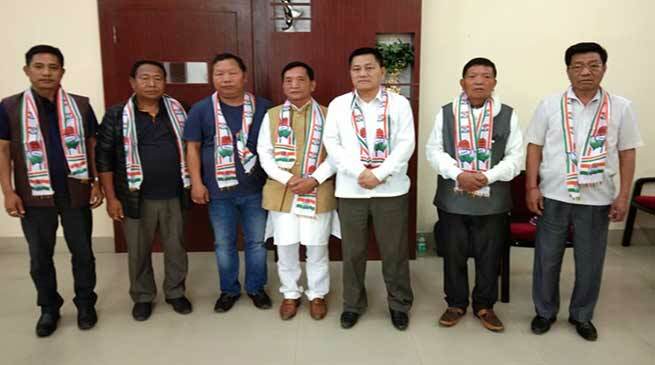 Khoda Gyati one of the prominent MLA candidates from 17th Ziro-Hapoli Assembly Constituency has formally joined the INC Party after resigning from BJP in presence of Takam Sanjoy, President, APCC, Padi Richo, former President, APCC, Nani Ribia, Ex-MLA, Hage Nama, President, DCC Lower Subansiri District, Nani Chatung, Ex-ZPM and Khoda Ruja(Rtd. Director, Handloom & Textiles, Govt. of A.P). Earlier Nani Ribia, Ex-MLA and one of prospective MLA candidates had joined the INC party on 16th March’ 2019.